“$15 an hour and a union.” In the past six months, this call has captured the attention of not only hundreds of low-wage workers who have taken job action but also millions more who’ve seen their courage. In November last year, 300 workers at New York City fast-food chains went on strike for a day and held a surprise rally in Times Square. Similar actions have since taken place in Chicago, Detroit, St. Louis, Milwaukee, Washington, D.C., and, most recently, Seattle. And this against the backdrop of the most sustained worker organizing effort at the nation’s largest private employer, Walmart. Something is clearly stirring among America’s low-wage workers. Working in fast food, at an average hourly wage of $9.18, is not only unrewarding in money terms – for many, it’s also a daily grind of degradation and managerial abuse. At a Jimmy John’s in St. Louis, workers have been made to wear signs saying “I made three wrong sandwiches today,” or, “I was more than 13 seconds in the drive thru” (The Nation, 5/10/2013). One striking McDonald’s worker at the April rally in New York stated that, after approaching his manager about a $200 shortfall in his paycheck, he wasn’t refunded, but suspended for a week! Experiences like this are more the rule than the exception: A report published in May found that out of 500 NYC fast-food workers surveyed, a whopping 84 percent had experienced wage theft in the past year (The Nation, 5/16/2013). Meanwhile, fast-food and other low-wage outfits like Walmart are reeling in the profits. In 2012, McDonald’s took in $5.5 billion, Yum! Brands $1.6 billion, and Starbucks $1.4 billion in profits; Walmart topped them all at $17 billion! (Fortune 500, 2013) The rest of us – in fast food, retail, or elsewhere – are stuck with declining wages and less union protection, or outright joblessness. Labor force participation is now 63 percent – lower than in 1978 – real wages are below their 1973 level, and only 11 percent of U.S. workers are union members – the lowest rate since the Great Depression (Bureau of Labor Statistics). A large part of this story is the offshoring and automation of manufacturing jobs, combined with wage suppression and speed-ups, but an equally large share of blame lies with the massive expansion of low-wage service industries. Just retail and fast food alone, which by no means encompass the entirety of this sector, employ nearly 19 million workers, or 14 percent of the workforce (Bureau of Labor Statistics). This enormous group of workers is no longer an anomaly, an “aberration” from those with “standard” living-wage jobs; they are the foundation of the 21st century working class, and their conditions the ominous future for all of us unless we mount a militant fight-back. Thankfully, signs of resistance from this very group of workers have been flooding in over the past months. Following the NYC walkout and rally in November, steady organizing was conducted by workers, unions, and community activists to build for a repeat NYC rally and another in Chicago, both in April. Then in the first half of May, similar actions exploded in St. Louis, Washington, D.C., Detroit, and Milwaukee. And on May 30, fast-food workers at Burger King, Taco Bell, and other companies in Seattle walked off the job. All of these actions have raised the demands of $15 an hour and the right to unionize. According to Josh Eidelson of The Nation, they “share several common characteristics: Each is a one-day strike by fast food workers, backed by a coalition of unions and community groups, targeting major companies throughout the industry and mobilizing a minority of the workforce in hopes of building broader support. While different local organizations have been involved in each city’s actions, the Service Employees International Union [SEIU] has played a significant role in all of them,” (5/15/2013). The demand for $15 an hour is indeed a huge step forward. At a time when the national minimum wage – even when observed (and, often enough, not) – is a measly $7.25 per hour, the idea of achieving an hourly rate more than double that – which could provide for a livable existence – has clearly inspired many to take part in these actions, but many more are needed for concrete gains to be won. Tactics so far have consisted of one-day actions involving a minority of each store’s workforce, with the central goal of gaining publicity rather than stopping the flow of profits to franchises and corporations. This approach is designed to avoid the black hole that is official NLRB organizing – a process that, even if successful at individual stores, could be easily overturned by large corporations like McDonald’s, Burger King, or Yum! Brands simply canceling franchise contracts and closing unionized stores, as Walmart has done in the past. While useful at this stage, one-day actions and publicity stunts are not enough to win union recognition, stable scheduling, or significant wage gains. The main task going forward must be to both broaden and deepen worker involvement. 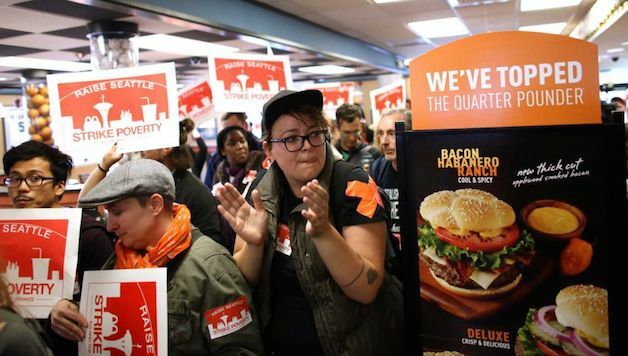 Not only should many more fast-food and other low-wage workers actively join these campaigns, independent worker committees empowered to plan, strategize, and organize future actions should be set up at once. Once these are firmly in place, the next stage must involve economic leverage, a way to stop the flow of profits to franchisees and corporate heads. The best way to do this is through long-term, majority strike actions involving large numbers of stores, possibly at a city-wide or even national level, possibly involving the transport workers, who are a key link in the supply chain, and certainly involving customers, who should be reached out to, won over to the workers’ side, and persuaded not to patronize struck stores. Only sustained work stoppages at a level big enough to impact corporate profits will ultimately be sufficient to bring giant fast-food companies to the bargaining table. Developing the struggle along these lines will not be easy, especially given the structure and history of the main organization behind these efforts, the SEIU. For its path-breaking foray into fast-food organizing, the SEIU can only be applauded. Unfortunately, however, the union’s record in achieving solid gains for members and developing rank-and-file democracy is severely lacking, as the current struggle of its California health care local against a militant, more democratic offshoot makes clear (Labor Notes, March 2013). SEIU’s leaders also have close ties with pro-corporate Democrats and a track record of steering activist campaigns, like Occupy Wall Street, toward electoral support for this bankrupt party. At the Seattle fast-food worker rally, SEIU organizers invited Democrat politicians to speak but denied speaking rights to Socialist Alternative candidate Kshama Sawant: the only candidate openly fighting for a $15 an hour minimum wage! For these reasons, the thousands of fast-food workers who are now taking courageous steps toward unionizing should beware of the SEIU’s dark side and proven willingness to sell out members for short-term leadership gains.